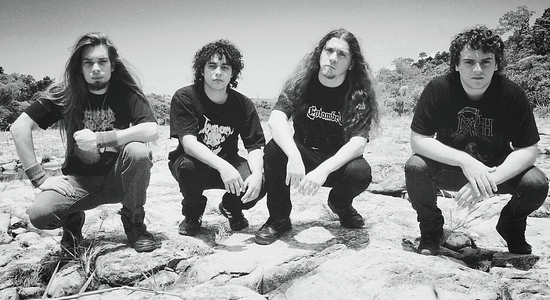 For those unfamiliar with the Paraguay-based act, Verthebral fire up classic ’90s death metal done right. “Old Man’s Memories” has a tone that may cause you to think about acts like Deicide or Cannibal Corpse, yet doesn’t feel dated. A primal rage fuels the mostly mid-tempo track, with plenty of headbangable moments. A sly melody and solid leadwork (not to mention the pacing) ensures that it’s as memorable as it is heavy. There’s no tricks or hurdles to jump – this is no-frills material that knows what it is and exactly how to succeed with it. It’s not often you come across bands from Paraguay and if this is the first time you have, you are bound to get blown away. This is primal yet superbly channeled death metal music that hearkens back to the days of SARCOFAGO, MALEVOLENT CREATION, MASSACRA, KRISIUN, REBAELLIUN, ANGELCORPSE and VADER. It’s a combination of all of the above and sounds rather fresh in its output. There’s a South American charm to the proceedings but everything is meticulously planned and executed. The production is suitably raw but also very clear and impactful. I daresay VERTHEBRAL have released one of the most stunning albums in the style this year.